Many people think that you need to be wealthy in order to travel, but I disagree with that. 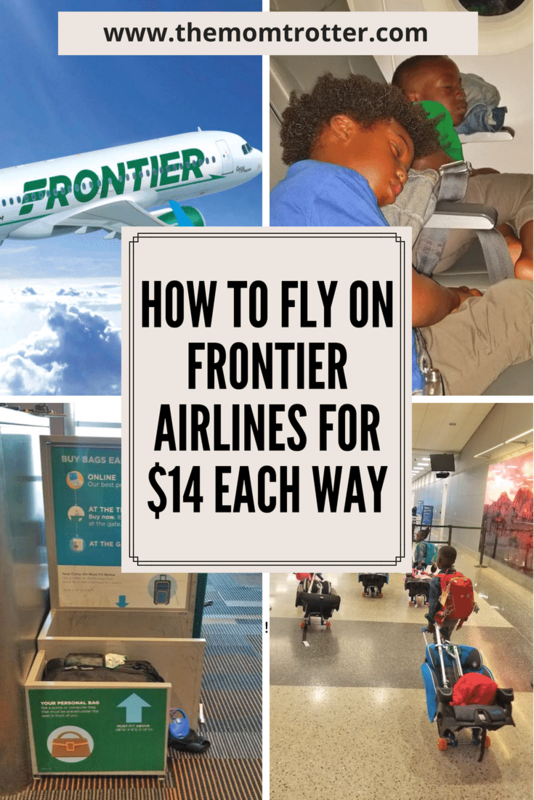 This post will show you how to fly on Frontier Airlines for $14 each way and go into details about my Frontier Airlines review. 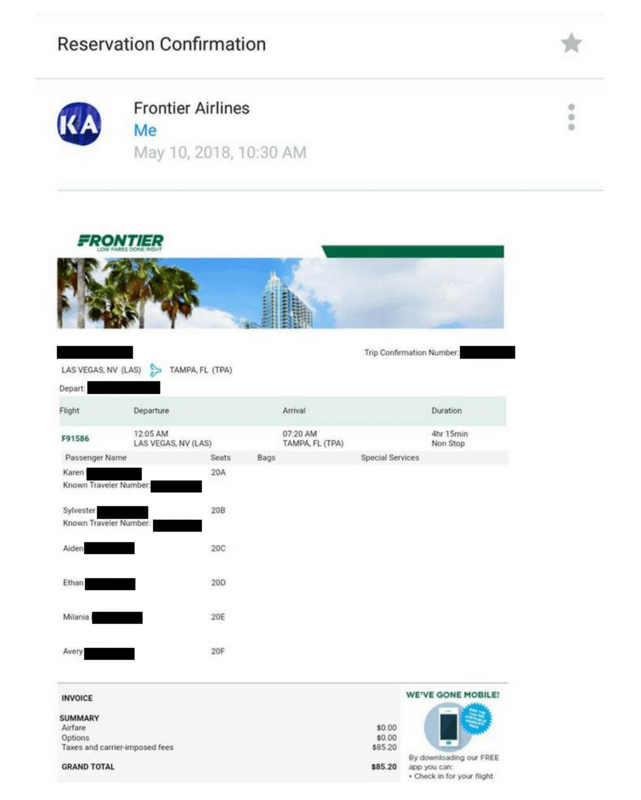 When I got an email alert for tickets to Orlando for $14 each on Frontier Airlines, I didn’t hesitate and booked it immediately. This wasn’t our first time flying Frontier Airlines so I knew what to expect, and so I planned accordingly. I am glad to be able share my tips for flying Frontier Airlines based on our experience with them. Frontier Airlines is considered a low-cost carrier, so they make their money by charging their customers for everything and anything. They charge a fee to choose seats, a fee for carry-on bags and checked in bags, and a fee for any in-flight snacks or food. The key to flying a low-cost carrier is figuring out how to successfully avoid these fees. I signed up for several flights email alerts, so as soon as the Frontier alert came through for $14 tickets, I purchased the tickets immediately without wasting time. Most of these deals sell out quickly so it is essential to make sure you purchase tickets as soon as you get the email alert. The tickets were exactly $14 each including taxes and I purchased our tickets on Frontier Airline’s website. You can see below that one way tickets for all 6 of costs $85.20. We basically only paid for the taxes when flying Frontier Airlines. That is the equivalent of a full tank of gas in my car for a local road trip, so I was pretty excited about this deal! Frontier Airlines charges between $10-$20 to select each seat, so I skipped this step when I was purchasing our tickets. If I had to choose our seats, our tickets would have doubled in price and my goal was not to pay a dime over $14. A lot of people worry about this especially when traveling with children and I can understand why. 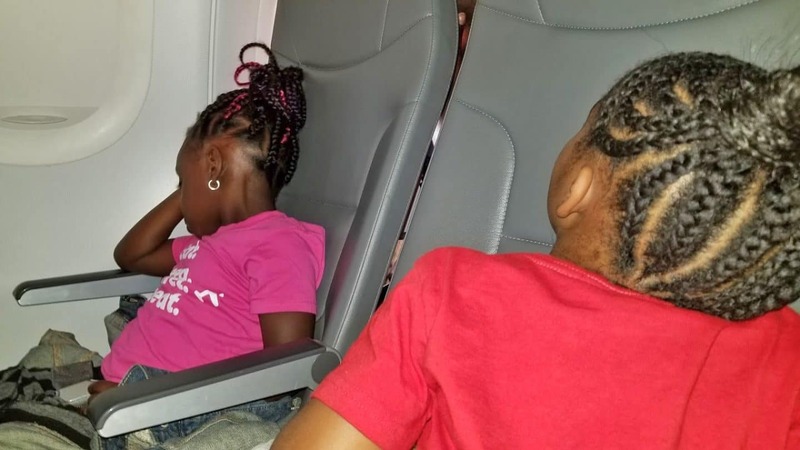 There have been times that children have been assigned separate seats from their parents on flights, and that can be problematic especially with young children. In such an instance, I don’t expect people to move so that I can sit by my kids, especially as those people may have paid to choose seats and it is very unfair. However, I was not worried, and took the risk by not selecting seats. We were lucky enough to all be assigned seats right next to each other when flying Frontier Airlines. Frontier Airlines charges $30 to take carry-on luggage on board and $25 to check in luggage. If you don’t pay the required fees beforehand, or your bag is bigger than a personal item bag, then you be charged $60 at the gate when flying Frontier Airlines. 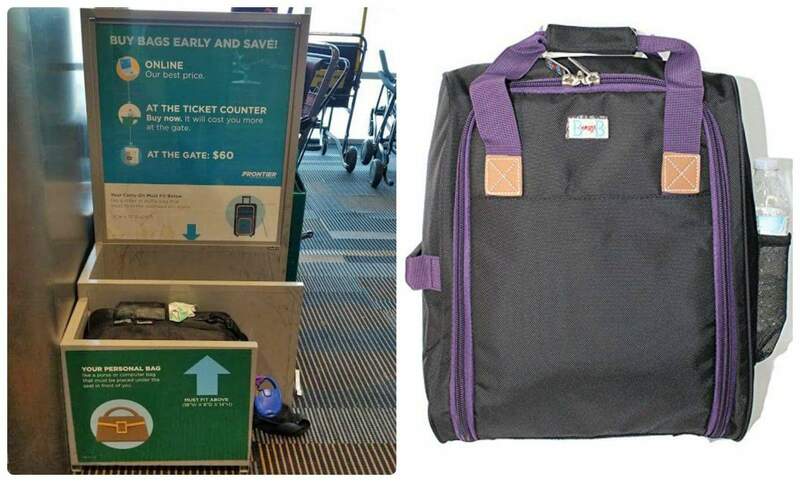 Frontier Airlines offers a free personal item bag sized 18X8X4 per paying passenger. I didn’t want to pay a dime for luggage, so I went on the hunt for a personal item approved luggage for myself. 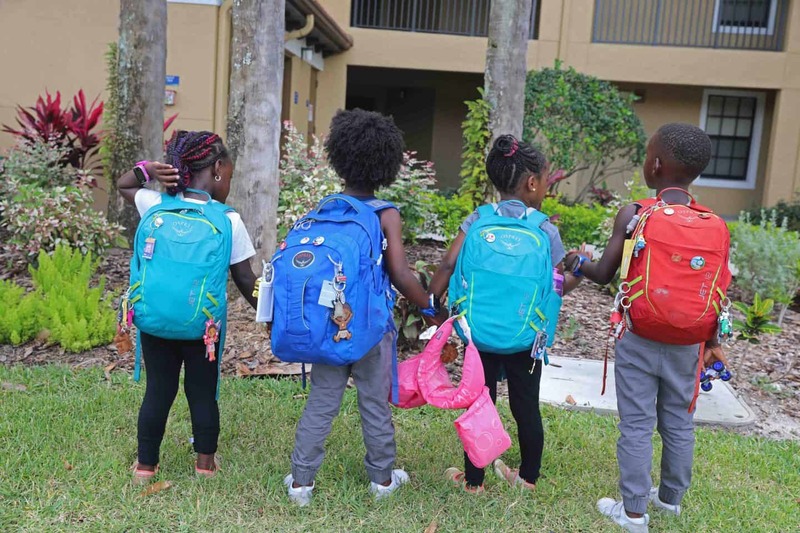 For the kids, it was easy as they use Osprey Jet 12 and Osprey Pogo Daypack backpacks which fit the personal item dimensions. I searched online for a while, reading lots of reviews and finally settled on the Boarding Blue Personal Item (By the way, it works for Spirit Airlines, American Airlines, United Airlines etc). I was able to pack for 5 days in Orlando in just a personal item sized bag. I used packing cubes and it made packing so much easier. If you don’t own packing cubes, please invest in them now. When flying Frontier airlines, you are allowed free check-in of a stroller and/or car seat. We didn’t travel with a stroller, but we did take the kids car seats. 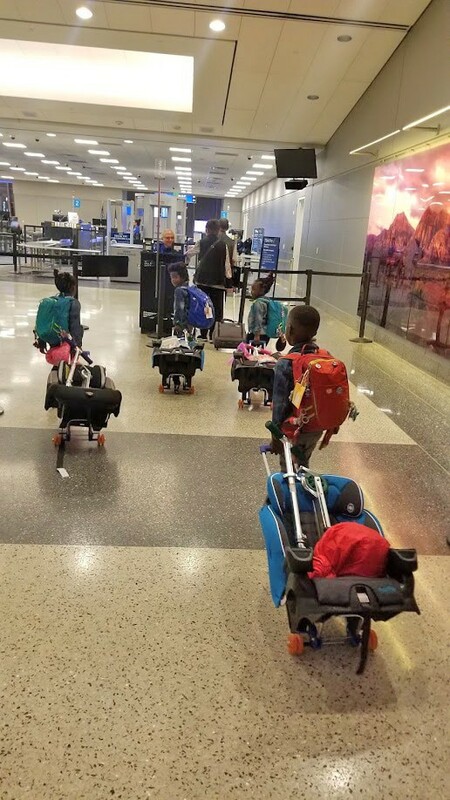 The kids used the GoGo Babyz Travelmate and EvenFlo Maestro Car Seat, and they were able to pull their own car seats around the airport with ease. We also traveled with their scooters and we were able to check everything in at the gate. We used a Car Seat Gate Check Bag and put the car seat, gogo babyz travel mate and their scooter inside the bag. All their bags were at the gate in Florida when we got off our flight in Florida. We have also taken the Safety First My Guide on a previous Frontier flight and Aiden rode in his car seat on the flight. So, you have the option to do that too if you want to. 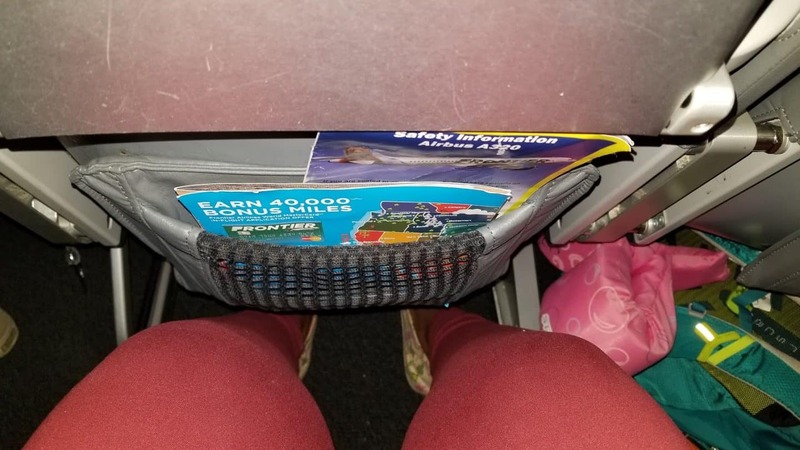 The seats on Frontier Airlines do not recline, so keep this in mind for long flights just in case you have a bad back and absolutely need to recline your seat. However, the seats are spacious and we had no issues with leg room. The seat back tray is really small, but It didn’t matter much to us because we didn’t really use it. Frontier does not have first class or comfort seating. We had a red eye flight and they didn’t have any blankets on the flight, so make sure to pack something for the kids to cover themselves with when flying Frontier Airlines. I also pack a light blanket when I travel, but mistakenly checked it with the car seats so the kids used their jackets as pillows and my jacket to cover themselves.. Also, a neck pillow is must for comfort. 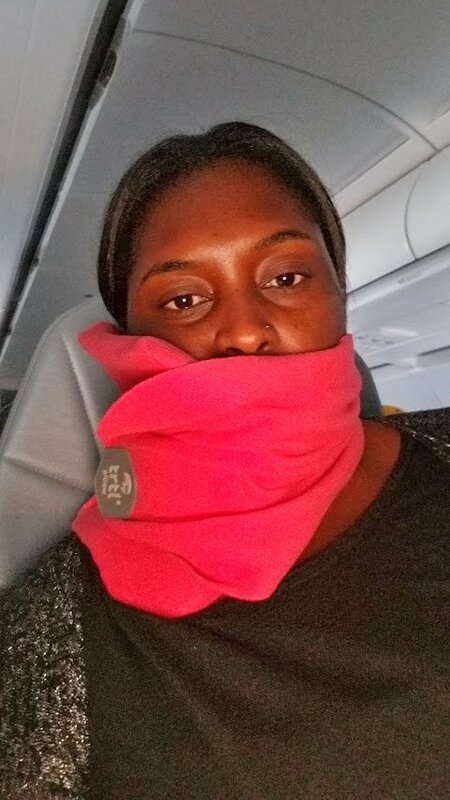 I use the TRTL neck pillow which is basically like a neck brace, and let me tell you something, It WORKS! Frontier Airlines charges for everything on their flight, except water. 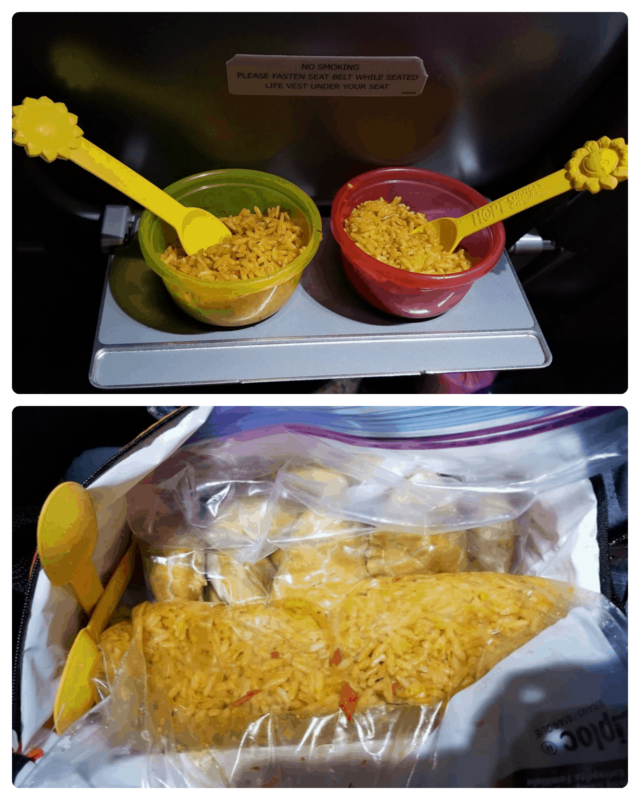 I packed snacks and food for the kids to eat, so we were able to fly without me purchasing anything on our flight. I didn’t know they offered water for free, so I packed an empty water bottled and refilled it at the airport prior to our flight. Most airports I have been to have water filling stations which I love. When packing a water bottle for kids make sure to get one that doesn’t have a straw as the air pressure will make it spill when you open it; lesson learned here. We also use these snack bowls and each kids gets their own. Frontier Airlines does not offer any in-flight entertainment and also their flights also do not have internet. Make sure to plan accordingly especially when flying Frontier Airlines with kids. Make sure you have enough to keep them busy to make for a smooth flight. If your kids have a tablet, make sure to download apps that work offline, and TV shows etc. If you are flying without a tablet, make sure to load up on toys for the kids. Make sure to reach my post on “How To Keep Your Kids Entertained On Flights” for all the tips you need. We had a red eye flight so the kids slept the entire flight. We had no issues whatsoever with customer service on Frontier Airlines. 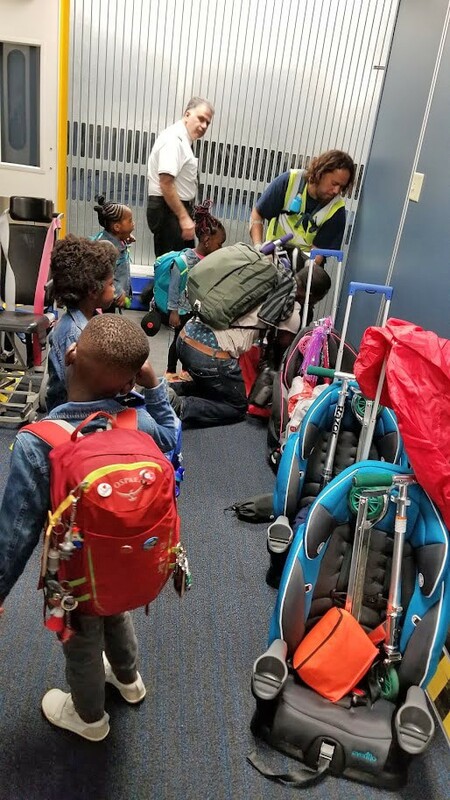 When we got to the gate, the gate agent helped us bag the kids car seats and scooters so that we could gate check it. The flight attendants were jovial and nice and very responsive when flying Frontier Airlines. I turned on my call light because I needed water and they were there right away with water. I definitely recommend Frontier Airlines and will fly them again. 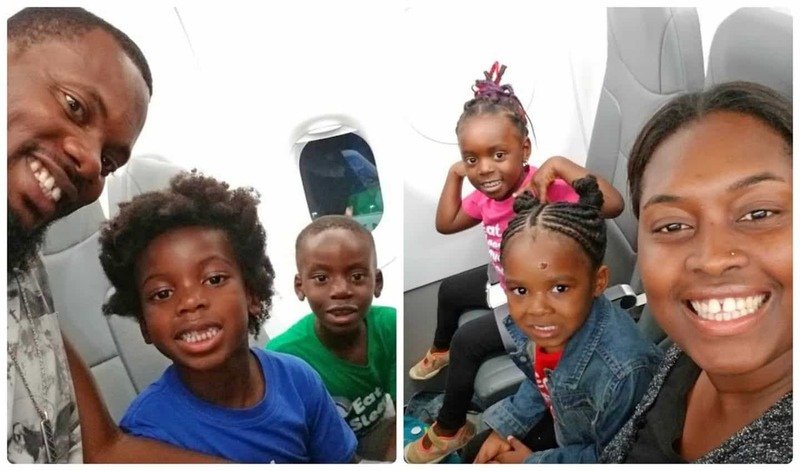 If you watch this video, (you can scroll to 1:19), you’ll see how amazing the customer service was, with the flight crew making sure to say hello to the kids and give high fives. • To save time, check in to your Frontier Airlines within the 24 hour check in time frame and print out your boarding pass if you have to. You can also scan your boarding pass from your email or use their mobile app. • Frontier Airlines participates in the TSA PreCheck program, so make sure to enter your known traveler number prior to your flight so that you can zoom through the airport. If you have kids with you then they can go through the TSA PreCheck line with you when flying Frontier Airlines. Overall, we had a great experience flying Frontier Airlines and will definitely fly them again in the future. Frontier Airlines usually has flight deals for $20 flights on their page, so pick any destination (I recommend the cheapest one to fly to), and take the kids and explore someplace new. I hope you have a great time, just like we did when flying Frontier Airlines. I’m so glad to hear the tips were helpful to you!! 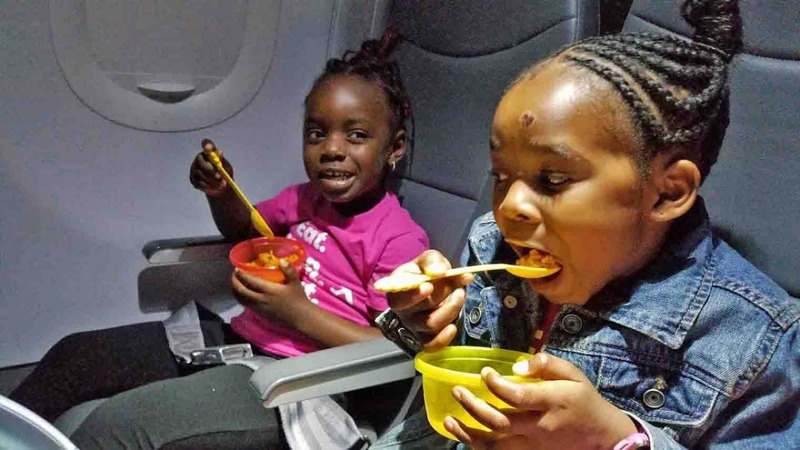 Yes, they enjoyed their jollof rice on the plane. I always make sure to pack enough food for them when we travel so we don’t spend any extra unnecessary money on junk food. This was a great read! Thank you for sharing. How do you sign up for airline discount alerts? Hey Danyel, glad it was helpful. Check out my post on “How To Find Travel Deals” to read more. Great article. How do you use the scooters? Entertainment at the place of lodging? Transportation in lieu of strollers? Can you elaborate? My new found obsession. So informative mama. Are these fares only with the discount den membership?